Shortly after 9 a.m. Friday morning, Ted Argote returned home from dropping his wife at work, parked in front of his Panola Street home and, as he walked out the door, called out a greeting to the paisley-patterned python that has recently begun sunning itself every morning in the front yard. “Good morning, Indiana!” Argote said, using a nickname picked in homage to Harrison Ford’s famously snake-averse archaeologist. While the sudden appearance of the exotic jungle carpet python on Panola Street was odd, even odder still is the litany of wild animals appearing around Uptown of late, and residents’ largely nonchalant reaction to them. With a supposed boa constrictor on Burdette, parakeets in Palmer Park, a peacock on Cohn and a fashionable little kangaroo (or wallaby) spotted on upper Magazine Street, it has been hard to tell this week where the zoo stops and the neighborhoods begin. The Argotes’ python first appeared about a week ago, they said, emerging out of the liriope to bask in the sun every morning around 9 a.m. Sure enough, on Friday morning, the liriope was clear at 8:50 a.m., but by 9:10, Indiana was in his spot. 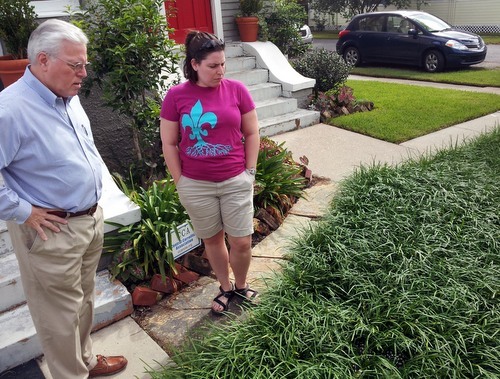 The liriope covers a spot where a magnolia tree died and was removed after Hurricane Katrina, and the family believes the holes left by the root system give the snake a comfortable home, well populated with lizards to eat. When the snake first appeared, they took a handsome photo of it and sent it to Audubon Zoo, where it was identified as a jungle carpet python, a non-venomous species native to Australia that can grow to more than eight feet long. Because of the way it coils itself in the tall garden grass, Indiana’s length is hard to estimate, though the Argotes guess him to be four or five feet long. 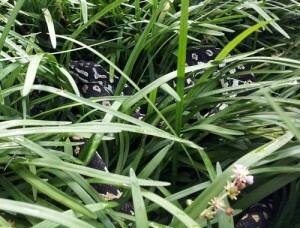 What do you do when you find a python in your yard? NOPD Officer Wilfred Eddington, who handles quality-of-life complaints in the Second District, called the Society for the Prevention of Cruelty to Animals and the state Department of Wildlife and Fisheries, but both agencies told him that they wouldn’t come pick up a snake that isn’t poisonous. Eddington said he was surprised that “in a city this size,” there is no agency to pick up such an animal, but said he wasn’t qualified to do it himself. “I’ll chase a perpetrator down an alley any day, but I don’t fool with snakes,” Eddington said. The Argotes have put an ad about the snake on Craigslist — perhaps one of the more unusual postings there of late, or perhaps not — in hopes that a snake enthusiast will come adopt Indiana before the winter, when he may be unable to survive the cold. Until then, they are in no hurry for him to leave. Midway through Indiana’s Friday morning sunning session, postal carrier Vendetta Ross-Tyler came by the house to drop off the mail. Initially frightened to hear there was a snake underfoot, she ultimately couldn’t resist leaning over the liriope bed for a look. “Isn’t that pretty?” Ross-Tyler said, but noted that Indiana wouldn’t be the most unusual creature she’d see on her route. 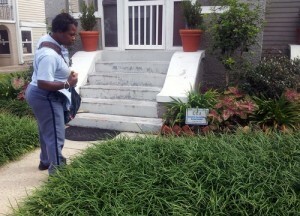 On Cohn Street, she said, she sees a peacock out front waiting for her every morning. Indeed, Ross-Tyler’s reaction to the python was typical among Uptowners: Everyone has seen something odder, even just this week. Ray Cannata, a pastor, former neighborhood association leader and documentary film subject, was walking on Magazine Street on Wednesday, and out in front of Bee Sweet Cupcakes, he saw a baby kangaroo swaddled in a laundry basket in the front seat of a vintage Corvette 427. 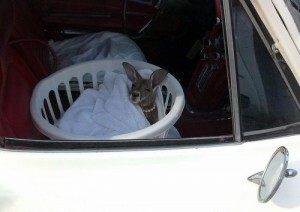 The kangaroo, Cannata said, appeared to be wearing a tiny pearl necklace — or possibly a strand of Mardi Gras beads. Bakery owner Steve Veech said he remembered the car and the customer — who struck him as “a little bit eccentric” — but he didn’t see the kangaroo. Based on the description, Veech suggested that the animal Cannata saw might have been a wallaby, the kangaroo’s smaller cousin. Cannata said he couldn’t be sure. I would like to report two sightings of a 6 foot BOA CONSTRICTOR snake in the 400 block of Burdette Street. The first sighting was a couple of months ago underneath a house on the corner of Pearl and Burdette streets and the second sighting was last week at 10pm the night before the first day of school in front of Benjamin Banneker Elementary School (seen by the Janitor and Sister Noel). It was observed sitting on top of the catch basin drain directly in front of the school and it slithered across the street into the catch basin drain directly opposite the school. Obviously this is a very scary and dangerous situation. I will be contacting Councilperson Guidry, the SPCA and the City as well, but any help that you all can give us would be greatly appreciated!! Since then, said association president Patrick Tucker, that snake has been photographed and identified as a ball python, another non-poisonous species native to Africa. It seems unlikely that it was the same snake as Indiana — Burdette to Panola is about a mile-and-a-half long slither. And on that note, Jungerbacker asked if the reporter had heard about the flock of wild parakeets that live in Palmer Park. You forgot to mention how loud and annoying that peacock is. He’s lucky he’s pretty. I thought there’ve been parakeet flocks here for decades. There are wild parakeets all over the City. Some kind soul on Orpheum Street in Old Metry strews birdseed in their drive for them. They are known as Monk Parakeets. Very pretty birdies. Google the name for images. The Monk Parakeets–also known as Quaker Parrots–are natives of Argentina. They’ve established little colonies all over the southshore. I’ve seen some out in Kenner out by the end of Williams Boulevard living in nests in tall antennas, along Vets Blvd in Metairie living in palm trees, along Claiborne Avenue foraging on neutral ground by the palm trees near MLK and along there, in the palm trees around Loyola Law School and even in the palm trees around the La. Supreme Court. They must like our climate. They’re about the size of a small crow or large bluejay and are green on top and kind of grayish on the bottom. You can’t miss that they are parrots by their appearance and they squawk pretty characteristically, so you can identify them even if you can’t see them. The parakeets used to live in the palm trees on loyolas broadway campus. Guess they moved due to the construction at cabra hall. Maybe he wanted a glass of tea. The other day while walking our dog in Broadmoor my wife encountered a snapping turtle. She scooped up our chihuahua for fear that he would get snapped. Doesn’t anyone watch “Swamp Wars”? It follows the venom patrol in Florida. They pick up all non-native snakes (they don’t kill them) because, if left unchecked, they take over the natural habitat. The city’s reaction to this seems way too shortsighted. Our only real concern with him living in the yard is that he’ll probably die when the weather gets cooler. I’d hate to see an animal die because it got loose or its owner let it go. I’ve had multiple responses to the craigslist post so he should have a more appropriate home before too long. The parakeets are actually monk parrots. They are ubiquitous in North America now, and you can find them nesting in palm trees, on cellular towers, and on the light poles of area stadiums. I am happy to report that the Panola St. Python has gone back home. Her owner saw the craigslist ad and came to get her this afternoon. Her name is Minerva and she got loose several months ago.